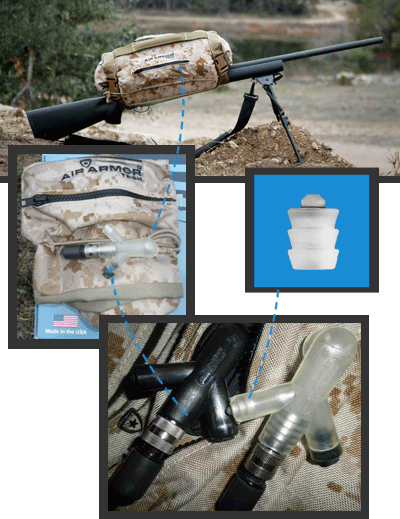 Recently introduced to the marketplace from Air Armor Tech, is the Mounted Scope Inflatable Protective Device (MSIPD). Ideal for hunters, marksmen, military and law enforcement, this device ensures their rifle scopes, and the sensitive crosshair alignment (the zero), are always protected. In addition to this primary mission, the MSIPD offers a carry handle, shooting rest and even floats the weapon if dropped in water. The MSIPD (pictured) protects a rifle or carbine scope in harsh environments to include mountains, wooded areas, or even an “urban jungle.” Often transported via the back of four wheelers, ATVs, trucks, in aircraft or the trunk of a car, rifle scopes now have an extra element of protection with this device. "The MSIPD and its patent pending system far exceeds any product available on the market today in its ability to protect a scope against blunt force impact which would otherwise cause damage or knock the scope off alignment," says Air Armor Tech President Blaine Tompkins. To ensure the pressure inside the device's air bladder is regulated, Air Armor Tech uses our own Model #118. As a pressure relief valve, the #118 (pictured installed in the manifold) makes sure air flow does not exceed the design or material limitations of the bladder. Tompkins continues, "Snipers, marksmen, and hunters are always concerned about bumping the scope or dropping the rifle, which would at worst, result in a costly repair or replacement, or at best, a missed shot. These concerns are significantly decreased, if not eliminated, with our Mounted Scope IPD." The Model #118 protects the MSIPD device against threats as simple as product misuse or as complex as changing altitudes during travel. "The Smart Products over-inflation valves are critical to the success of our line of products for a variety of reasons. All air bladders are designed to inflate when in use and deflate for compact storage when not in use, over and over during the life of the product. Thus, over-inflation protection is needed on a regular basis, not just in case of emergency. In addition, users of our products operate in extreme environments, to include the low pressure of a mountain hunt or the heat of a desert trek. The valve protects from the natural expansion of air in cases like these," says Tompkins. "Many hunters use air travel to get to their hunting or shooting destination. An un-pressurized cargo hold of an airplane will cause the pressure in the IPD to increase, resulting in a need to control this pressure." 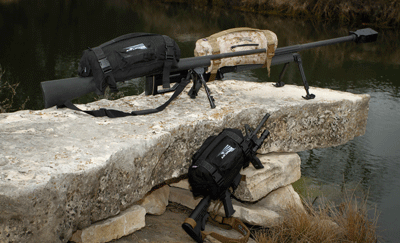 The MSIPD is available in Extreme or Tactical versions for long rifle or carbine. In addition to the MSIPD, Air Armor Tech is in the prototype/development phase for additional IPDs (inflatable protective devices) to include: Carbine/Rifle Case IPD, Shotgun Case IPD, Spotting Scope IPD, Helmet Bag IPD, Camera Case IPD, and Camera Lens IPD. All products continue to incorporate Smart Products' Model #118 to regulate pressure. Available as a 1/4" Barbed design, Model #118 is a great in-line check or pressure relief valve option. Like all of our valves, Model #118 is customized to fit a unique design criteria by plastic body material, o-ring material, and spring pressure. Specifically, these models are available to be molded into Polypropylene, Nylon, Acrylic, Acetal, PVDF, Polycarbonate, Ultem®, and ABS. O-rings options are Buna-N, EPDM, Viton®, Silicone, and Fluorosilicone. Opening pressures range from 0.09 to 20 PSI. Air Armor Tech, LLC, a veteran owned company, provides high quality, American made protective gear designed to meet the exact needs of customers in the military, law enforcement, and outdoor recreation markets to include the hunting and fishing industries. For more information, click www.airarmortech.com.